At least three people have died and two remain missing as severe flooding caused by substantial rainfall and snowmelt inundates several Midwestern states. Across the region, hundreds of homes are flooded and families are displaced. Waters have reached historic levels, spurred by a late-winter storm last week. Flooding caused water to rise hitting 41 feet in Plattsmouth, Nebraska, and more than 30 feet in Iowa’s Fremont County. Freeport City, Illinois, anticipated its worst flooding in 50 years — and that’s the best case scenario, according to the Associated Press. 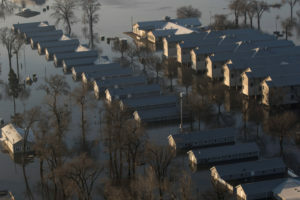 As river levels begin to top off and slowly recede in Nebraska, Iowa, Missouri and Kansas, states like Illinois and North Dakota are readying for similar disasters. Here are some ways you can help these families and communities. The Salvation Army will be distributing bottled water and clean up kits to those in areas affected by floods reports the Omaha World Herald. The nonprofit is raising money for these efforts through its website. United Way of the Midlands is collecting donations to help people in Iowa and Nebraska affected by flooding. Donors can direct their donations to other communities affected by the flooding online, or text FLOODRELIEF to 41444 to donate. Convoy of Hope, a faith-based nonprofit that brings food, water, emergency and other relief supplies to natural disasters has set up a dedicated webpage for donations to its flood response in the Midwest. Community foundations in Nebraska have set up a variety of disaster relief funds to support locals affected. The Grand Island Community Foundations is accepting donations for the greater Hall, Howard, and Sherman Counties. The Kearney Area Community Foundation is collecting contributions for the Kearney area. The Custer County Foundation and the Merrick Foundation cover Custer and Merrick Counties respectively. The Food Bank of Siouxland has been making food deliveries to flood victims in places like Hornick, Iowa. You can donate to their cause on their website *with a note* saying you would like your donation to target flood relief. You can find verified GoFundMe fundraisers here to support individuals, animals and homes affected by the flooding. The Salvation Army is also seeking volunteers from across the U.S. to fundraise for flood relief. You can register online or by calling 402-898-6050. Though the United Way of Central Iowa is not currently seeking volunteers, the organization encourages those interested in assisting flood victims to register online in case more help becomes necessary. The Nebraska Department of Agriculture is accepting volunteer help and agricultural donations like hay, feed stuffs and fencing for farmers and ranchers in the state. The department will take your details and the resources you are willing to donate over the phone at 1-800-831-0550. The Foodbank for the Heartland is currently working on a disaster relief plan with other organizations across Nebraska and Central Iowa. More information about how to donate funds and food for those affected will be available on their website once the plan is finalized, according to Stephanie Bayle, Foodbank for the Heartland’s brand manager. Facebook has set-up a crisis response page where you can donate money to flood victims or offer help in the way of shelter, food, clothes or other miscellaneous supplies. We verified organizations to the best of our ability. If you aren’t sure about the legitimacy of a charitable organization, visit Charity Navigator. Maea Lenei Buhre is a news assistant at the PBS NewsHour.